Part of the 10 Days of OPI posts I am doing! As soon as I saw the Oz collection by OPI, I fell in love with the sparkly colours. The OPI collection is inspired by the film The Great And Wonderful Oz, based on the tales of Wizard Of Oz. Other makeup brands have teamed up with Disney to create Oz inspired products such as Urban Decay with the Glinda Palette. Where Monkeys Fly! is a gorgeous glitter coat with large hex gold pieces, and small silver rainbow iridescent sparkles in two small sizes. This is a truly unique glitter and I could not wait to get my hands on it. 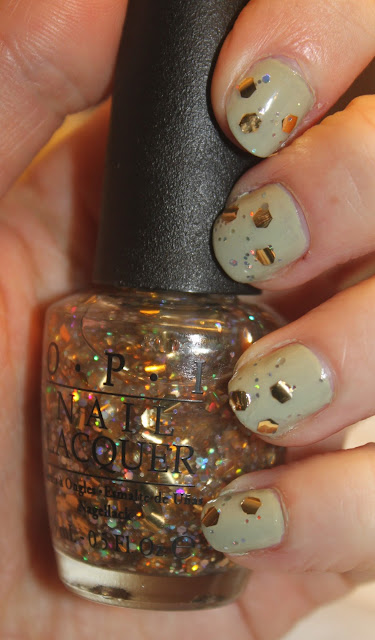 I painted one coat of the glittery coat on top of OPI Stranger Tides from the Pirates of the Caribbean collection. I am in love with this top coat and it is by far a statement. I found that the glitters in the whole of the Oz collection weren't as glittery as they appeared. I had to use the brush to pick up bigger pieces of glitter as the the brush didn't seem to pick up much glitter. I also found the same problem with Lights Of Emerald City. Nevertheless, once I had the desired look I could not stop looking at my nails. The glitters in the collection are stunning and I can't wait to show you a few more. You can grab this stunning shade for £11.50 at your nearest OPI stockist. What do you think of this glitter? Do you like the OZ collection? Have you bought anything from the collection? The Oz Collection is amazing, love this top coat! Wow, love the OPI Stranger Tides colour. Nails look fab, very glam! I was really excited when I heard that OPI had collaborated with Oz too! I'm a little dissapointed that the glitter isn't very glittery though! ..F A S H E R N A B L Y - L A T E.. I love this Hannah! It's so nice. I haven't seen a polish like this before! Hope you have a lovely Easter.